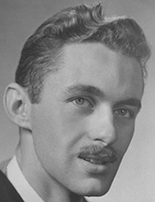 Charles (Peter) was born on February 10, 1930, in Vancouver, and died September 25, 2014, in Vernon. He graduated from Lord Byng High School in Vancouver in 1948. He attended UBC, where he completed an honors course specializing in the nutritional chemistry of farm animals. He was awarded a scholarship for graduate studies at Reading University, UK, leading to a PhD degree. In 1959, he accepted a position as a research scientist in animal physiology at the Canada Agriculture Research Station in Lethbridge, AB. Charles retired in 1989. He and his wife, Mary Elizabeth (née Ellison), BSc’57, established a home in the North Okanagan where he developed a large garden specializing in alpine plants from many of the world’s mountain ranges. Charles was a keen outdoorsman, an avid reader, a meticulous craftsman, enjoyed classical music and was a lifelong learner. He is survived by his three children and five grandchildren.